Treadmill: Yeah, you’re walking upright, and you can turn up the angle to simulate hills, but with every step, the ground beneath you effectively gives way. Sure, the Earth moves, but not fast enough for your lower extremities to notice; hence, you don’t get the same exercise. Stairmaster: Stepping-machines are more like walking in sand than on dirt, and they have the same problem as treadmills: they move in ways the planet does not. Pretty much every other exercise device has similar limitations. They’re fine for working your heart and large muscle groups, but you can work in the gym like a fiend and still find yourself winded on the trail, stepping aside for veteran hikers twice your age. Find stairs: Stair-lapping is the most akin to going up and down steep hills. Frankly it’s a lot steeper than most trail grades, but you’ll be doing it only for a short time. As with all exercises, start with a few, work your way up, and increase your speed over time. Carry weight: I read about one urbanite who trained for Denali by wearing a 50-pound pack while walking on a treadmill/Stairmaster. Extreme, but the premise holds: adding weight adds resistance, which builds heart and muscle strength. Some people do this with water bottles: if the weight’s too unbearable they just dump some of the water. Jog if you can: Running beefs up leg and ankle strength and vastly increases your heart capacity. Running also beats the crap out of your joints, so don’t bother if you’ve got weak hips, knees or ankles. And if you can’t do any of that: At the very least, take walks in your neighborhood, combined with any strength exercises you can come up with on your own. Don’t rule out the machines at the gym: They aren’t best suited for hiking, but they’re a lot better than nothing. This feels like a pretty good introduction. I’ll add specific hiking-related exercises in a separate post. Related: Hiking to lose weight. Subscribe to comments with RSS or TrackBack to 'Fitness for hiking: the basics'. Those are great ideas for non-hiking workouts. Another idea would be core muscle exercises. 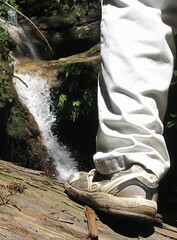 Your core is probably the most over looked group of muscles on your body but the most essential to a comfortable hike.